Getting your Minnesota driver's license doesn't have to be hard. 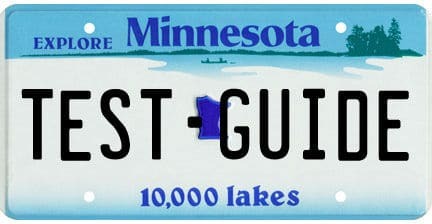 Use Test-Guide.com's free Minnesota practice permit tests to prepare for your exam the fast and easy way. Our questions come right from the source - the Minnesota DVS driver's handbook. Our free MN practice exams don't require any registration or sign-up...and give you a score report with detailed explanations. How Many Questions are on the Minnesota Permit Test? What is the Passing Grade for the Minnesota Permit Test? How Old Do I Have to Be to Get a Permit in Minnesota? How Long Do I Have to Wait Before I Can Get a License in Minnesota? What is the Minimum Supervised Driving Time Before I Can Get a License in Minnesota? How Old Do I Have to Be to Get a Driver's License in Minnesota? What Restrictions Will Be on My Driver's License in Minnesota? Is there anything else I need to know about getting my license in Minnesota? Q: How Many Questions are on the Minnesota Permit Test? There are a total of 40 questions on the Minnesota permit test. Q: What is the Passing Grade for the Minnesota Permit Test? Q: How Old Do I Have to Be to Get a Permit in Minnesota? You may apply for a permit in Minnesota when you are at least 15 years old. Q: How Long Do I Have to Wait Before I Can Get a License in Minnesota? You can get your license in Minnesota when you have waited at least 6 months after you received your permit. Q: What is the Minimum Supervised Driving Time Before I Can Get a License in Minnesota? You can get your license in Minnesota when you have had the following supervised driving time: 40 hours, 15 of which must be at night (effective 01/01/15). Q: How Old Do I Have to Be to Get a Driver's License in Minnesota? Q: What Restrictions Will Be on My Driver's License in Minnesota? Q: Is there anything else I need to know about getting my license in Minnesota? In Minnesota, permit applicants younger than 18 must be enrolled in driver education. An optional 90-minute supplemental curriculum for parents is to be established by July 1, 2014, to provide information concerning graduated licensing, safety risks and the potential influence of adults on driving behavior. In Minnesota, the permit holding period also applies to license applicants 18 and older unless they have completed driver education. In Minnesota, license applicants younger than 18 must have completed driver education. Provisional license holders must be crash-free to qualify for a full license.